brood: (verb) 1. to think or worry persistently or moodily about; ponder: He brooded the problem. 2. to dwell on a subject or to meditate with morbid persistence (usually fol. by over or on). Have you ever known a brooder? Brooders study on a particular thing or situation at length, focusing all of their energy on it until the brooding drains the energy right out of them. Even worse than knowing a brooder, of course, would be BEING a brooder. How exhausting. Do you tend to brood? Do you often fixate on things to the point of having the same thoughts on a repeat cycle? If you do have this unproductive tendency, I hope this article can help you rethink your course of action the next time your brooding mechanisms kick in. Morbid persistence. What part of that sounds good? It’s the way I approach my own e-mail actually. My husband teases me a lot about the amount of time I spend with e-mail but I get a very high volume of it and I don’t want it to just sit like a lazy great uncle. I hate the thought of someone wanting something and having to wait for me to get to them. Not only do I hear from a great number of people in regards to my blogs, I also oversee a number of blogs/websites that we host. Sometimes people have problems they need help with, sometimes they just want to run something by me. If someone needs my help, I want them to have it asap. Some people allow their e-mail to build up to the hundreds. Doing so seems kind of like a waste to me. They just sit there, taking up space – not accomplishing anything. Brooding is a lot like unopened, undealt with e-mail. Except it’s far worse, actually. Not only does brooding take up time, thought, and energy – it actually makes the problem(s) or perceived problem(s) bigger than they really are. Have you ever noticed that worry clobbers rational thought? Brooding eats rational thoughts alive. It’s happened to all of us. A noise in the night? – Has to be a burglar and, well yes, as a matter of fact he is on the roof. Your 15 year old son’s hair is longer than your hair was at his age. And you’re the mom. Brooding on his beautiful locks will only compound the problem. You’ll conjure up various and assorted scenarios and each one will star your son as a failure, a ne’r do well, and possibly a bum. Are these thoughts really what you want to focus on? Do you really want to continually focus on and dwell upon negative images of your son? Brooding is worry with OCD. It gets locked in and just can’t stop. The next time you find yourself focusing on worrisome thoughts or brooding about things that “could” happen or brooding over situations you “wish were different” – take action. Ask yourself if there is a present problem or if you’re simply fretting over a potential problem. If you’re worried that your vehicle won’t make it another year, it’s a potential problem. If it’s in the driveway and doesn’t seem to want to ever leave, no matter how many times you turn the key – it’s a present problem. If you have a potential problem, stop wasting valuable energy on situations that may possibly be around the corner and take care of what’s currently on your street – right in front of you. Parents, this is for you us: Stop brooding over every single thing your child does, says, and/or wears. I know, I know, I know. Parents who love their children will worry about their children but constantly brooding about all the little things will drain you and you won’t have anything left. And there’s always this: You’ll drive everyone crazy in the process. Never good. Maybe this would be a good time to remind you of that definition again: to dwell on a subject or to meditate with morbid persistence. First of all, memorize the definition above and repeat it to yourself when you feel yourself beginning to worry or brood. If you promise to memorize it, I promise not to hit you with it anymore. Second of all, ask yourself if the subject of your worry falls under the category potential situation or present situation. If the situation is a present problem or issue, leave brooding mode and enter action mode. Do what you can to alleviate the problem. If it’s beyond your means, ask for help. Back to me and my e-mail: When someone we host has a problem with their website, I address the problem as soon as possible. If it’s beyond my reach, I find the appropriate person to refer them to. Either way, the e-mail is opened, dealt with, and deleted. There’s no need to worry with it anymore because it has been taken care of. If the situation is a potential problem or issue, ask yourself how reasonable you’re being and be brutally honest. If the potential situation could very well become a present situation, again enter action mode. At the very least, share the concern with someone else. They, very often, can help you see that your worry is out of proportion to the actual circumstances. Other times, they may have extra information or advice that could set your mind entirely at ease. Last of all, hit the delete button. Once you have ascertained what (if anything) you can do about the situation, rest assured that you’ve done all you can. Give yourself permission to enjoy life and allow everyone around you to do the same. Here’s a quick exercise to illustrate the power of brooding. Stare at the picture of the beautiful chicken below. Stare directly at her for an entire minute. Imagine what she might be thinking, what it’d be like to raise chickens, what you’d name her (hey, why not? ), what it’d be like to live on a farm… Then, after a minute, continue reading below your new friend’s picture…. During the time you spent fixated on the chicken, you didn’t think about or acknowledge anything else. For that minute (or ever how long you lasted! 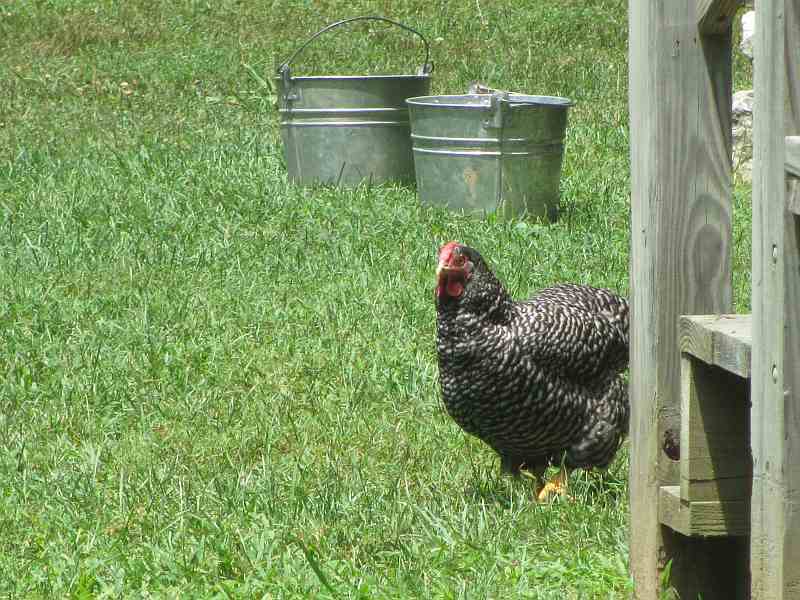 ), the only thing in your world was you and a darn good-looking chicken staring back at you. Do you see the implications? This was just one minute. Can you see the potential harm negative, destructive thoughts can do to a person when they spend endless minutes and hours wrapped up in them? If you spend day in, day out brooding on miserable thoughts and tragic scenarios, what must that do to your psyche?!?! Treat your thoughts carefully, they’re far more influential than you realize. Thoughts always grow into words and actions. Now tell me that’s not reason enough to entertain worthwhile, constructive, and positive thoughts as opposed to foolish, destructive, and negative ones. Worrying about things is pretty much useless, though it took me a long time to figure it out. I used to do it all the time… things that might happen, things that were going to happen, things that were happening… you name it, I worried about it. Usually to the point that I wanted to pull out my own hair and curl up into a ball and cry. I slowly got out of that habit by adopting a simple guideline for my worrying. Is there anything I can do about this problem, right now? If yes, do it. If no, stop worrying and move on. Worrying is fine if it leads to some kind of action, but all it does is give you a headache if you’re worrying about something you can’t do anything about. This has helped me a lot. Thanks for your post and the reminder that worrying rarely gets anything accomplished. Excellent way to analyze the problem and instead of worrying about it, check if it is truly a problem. If so, they go about fixing it. But if it is just a potential problem, we don’t need to worry about it. I am very much like you that if I face a problem, I get down to solve it and get it over with so that I can focus myself on more important tasks. Great analogy about brooding and unopened e-mails. As you mention in your last paragraph: thoughts lead to action. But as we all know, thoughts can also lead to INaction. Steven, What an analogy! Love it! You’re so right, negative thoughts can totally lead to inaction. Defeatist thoughts are the very devil! Hi, I like your articles. I would just like you make a change in the spelling of ‘Mahatma Gandhi’. It is ‘Mahatma’, not ‘Muhatma’. It mean a great soul. Maha(great)+Atma(soul)= Great Soul. Rishabh, Thank you so much for pointing out the mistype! Most of all, thank you so much for being so kind and gentle about it! Mahatma Gandhi would be very proud! Sometimes my fingers get to typing so fast, I don’t realize what I’ve typed! Thanks again, SO MUCH!